You'd love to spend 30 minutes of your life attempting to fold a mini tissue box for Kleenexes that dispense perfectly well from their original package, wouldn't you? I thought so. 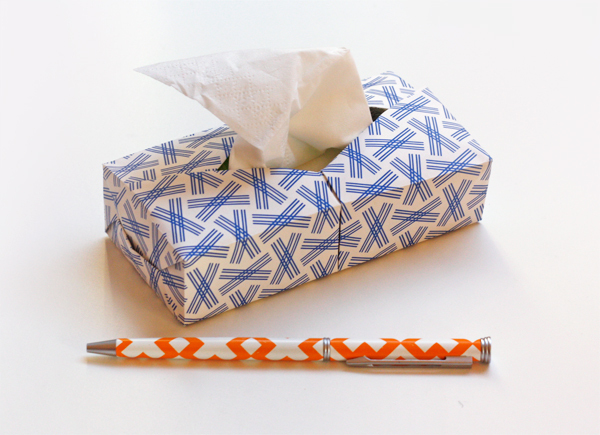 Follow along with this origami tissue box tutorial at Marigami Origami, designed by Paul Ee. 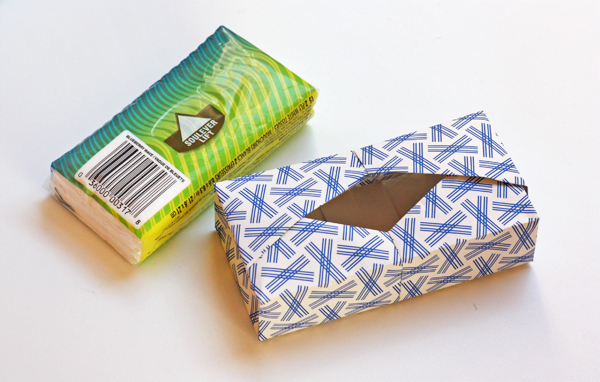 The 9.5" square of decorative paper I used makes a box that perfectly fits a Kleenex travel pack. For the record, I'm never doing this again. Darned cute though, isn't it. It would also be cute for dispensing a small ball of yarn or baker's twine. How about I make my kids do this. Yeah, I think I'll torture myself and try to make one of these as well. So adorable! Need one but must be for the little squat Kleenex box as my bathroom is tiny and oh so compact! Very cute. I'll have to make one now. And I absolutely love your pen! Where did you get it? Office Max, several years go. It came in a set of three with different orange and white patterns. So cute! There should be a little red "P" icon at the bottom. Is it working?